It is easy to simply ignore the check engine light on your vehicle’s dashboard. Most of us are guilty of doing so at one point or another. However, that little light was designed to warn the driver of many problems the engine may be experiencing. If the check engine light is currently on, it is important to have an expert technician from Liberty Auto Center perform a diagnostic test. With the test complete, our service providers can better understand the problem you are experiencing. We can provide you with potential solutions to any engine problem your vehicle may be experiencing. Some solutions could be an easy fix, while others may require a bit more time and investment to repair. Whatever the problem, our auto engine light check service offers quality, affordability, and timely repairs. When researching a service center that can perform an auto engine light check near you, there may be a few results. However, the community stands by Liberty Auto Center for one reason: high quality service. For the past 32 years, Chuck and Troy Parcelles have focused on offering 100% customer satisfaction and quality workmanship. We understand that not all vehicles or customers are the same. The check engine light on your car may not indicate the same problem that your neighbor may have experienced a month ago. We treat each case individually, ensuring our technicians perform a complete diagnostic and inspection, and then they can make repairs promptly. 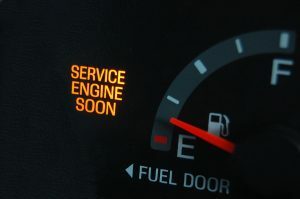 If the check engine light has been on in your vehicle for some time now, please do not hesitate to contact Liberty Auto Centers. Something could be seriously wrong with your engine. Call us for an auto engine light check appointment today at 240-686-6613 (Flower Hill) or 240-912-5625 (Redland). Location: 7201 Muncaster Mill Rd.